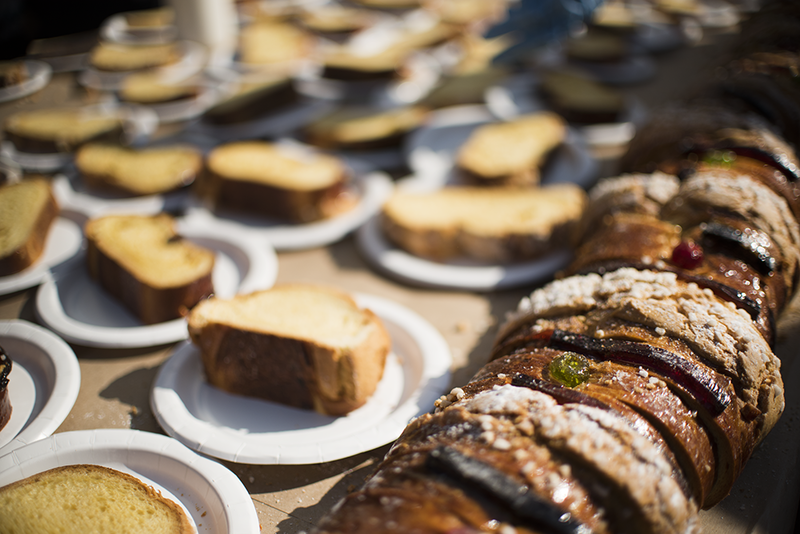 The line stretched down Firestone Boulevard and snaked all the way around Downey Avenue on January 5 as people eagerly awaited the unveiling of Porto’s Bakery’s Rosca de Reyes, a sweet bread that is traditionally eaten on El Día de los Reyes Magos (Three Kings Day) in various Spanish-speaking countries. The beloved Cuban bakery partnered with the California Milk Processor Board, creators of the iconic got milk? campaign, to bring the massive Rosca de Reyes to life. Coming in at 24 feet by 2.5 feet and weighing roughly 125 pounds, the lengthy loaf could land a place in the record books as Los Angeles’ largest-ever rosca de reyes. 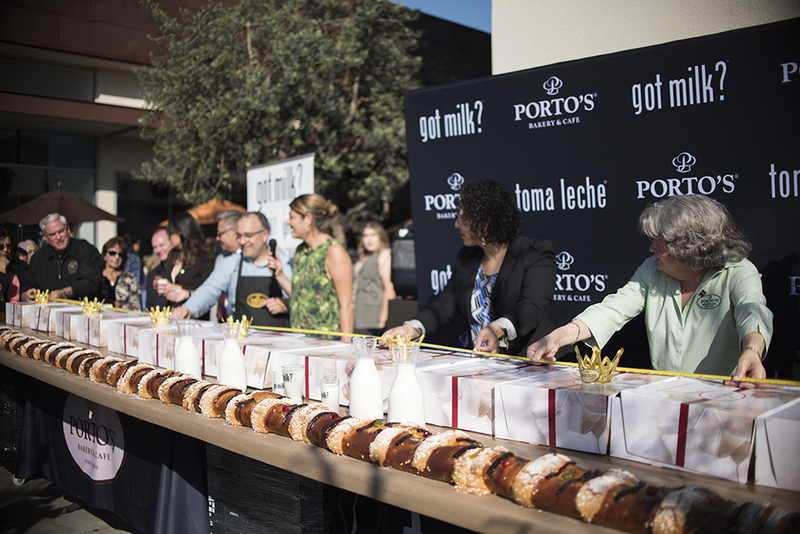 A team of six bakers at Porto’s executed the challenge, led by executive pastry chef Tony Salazar. Starting at 1 a.m. on Friday morning, they whipped through 60 pounds of flour, 70 eggs, 12 pounds of sugar, and 18 pounds of butter. The ring-shaped pastry is meant to symbolize a king’s crown, with red and green candied fruit adorning the top to resemble rubies and emeralds, while a small baby figurine hidden within the bread is meant to represent Jesus. Whoever gets the lucky slice with baby Jesus is meant to throw a party on February 2, dia de la Candelaria. 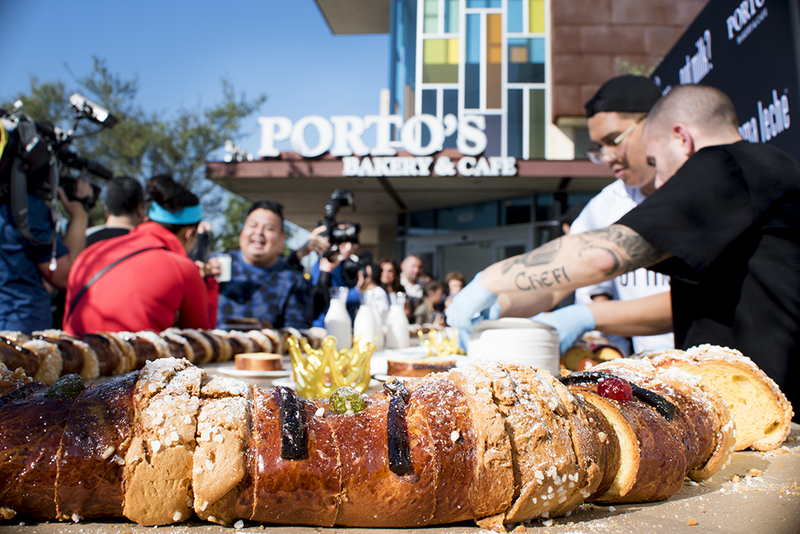 “Celebrating these traditions together with family and friends is what keeps our communities connected to each other and thriving,” said Betty Porto, the co-owner of Porto’s and a familiar face to anyone who frequents the bakery’s four different locations in Burbank, Glendale, Buena Park, and Downey.